FLORIDA - The Florida Highway Patrol announced that I-75 may be closed due the swelling of the Santa Fe River. According to FHP, the Santa Fe River under I-75 has rapidly risen 15 feet within the past 36 hours due to the heavy rainfall over North Florida from Hurricane Irma. Additional bridges that may be impacted include: U.S. 27, U.S. 41, S.R. 47 and possibly U.S. 121. Staff with the Florida Department of Transportation and the Department of Highway Safety and Motor Vehicles are monitoring the bridges that may be impacted by the flooding 24/7. If the river rises to an unsafe level, the bridge will be impassable both northbound and southbound, and would be closed immediately. Floridians that are traveling should avoid the area if possible. 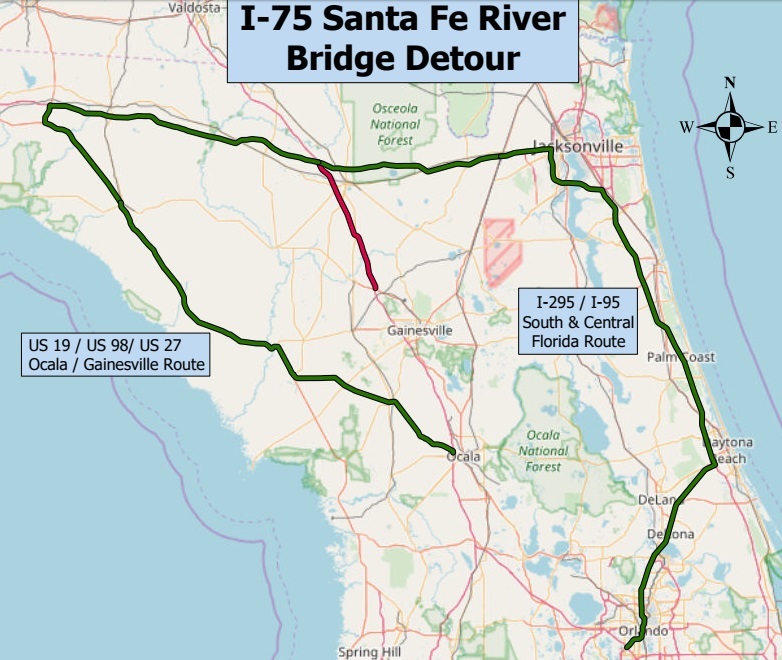 FHP has published the above detour map in the event that I-75 closes. Floridians should consult www.FL511.com for up-to-date information on road closures and travel routes.